The following two articles were published in the Spanish newspaper Ultima Hora, Sunday 11th November 2007 and Monday 12th November 2007. The knights and dames of the Military Order of the Collar of Saint Agatha of Paternò belonging to the Grand Priory of Aragon and Catalonia, about 50 persons, held yesterday in Palma their annual ceremony for the investiture of new members, 15 candidates. An act of homage in advance of the celebrations which will take place in 2008 to mark the 800th anniversary of the birth of James I its founder. The event was presided over by Francesco Paternò Guttadauro Ayerbe of the Dukes of Carcaci, Prince of Emmanuel and Aragon, among his many titles. He is a direct descendent of James I. The ceremony was moreover presided by the General Commandant of the Balearic Islands, José Emilio Roldàn, in the military church of Santa Margarita. During the course of it the insignia of a Grand Prior of the Order was awarded to Saint Ferdinand, patron saint of the Regiment of Engineers of the Army. In 2008 Majorca or Madrid will be the site of the important events that the Order will organize to celebrate the 800th anniversary of the birth of James I as Francesco de Paternò announced. 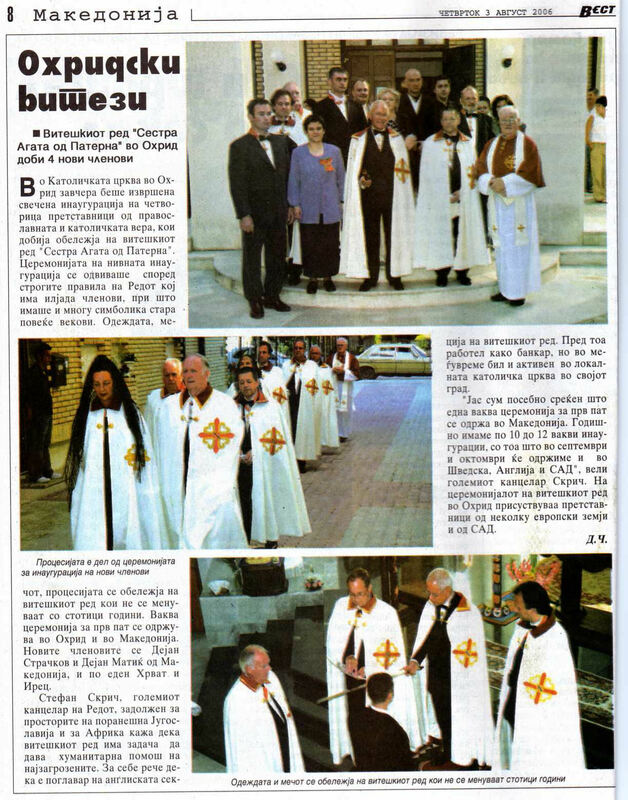 The Grand Master of the Order added : “The real importance of these ceremonies is to keep alive the ideals of chivalry, in particular to give assistance to the most needy”, since by now the Order has lost its military aspect which in previous times helped in the defence of the Islands against attack. The Prince, who lives in Sicily, expressed his gratitude for the warm welcome that he had received on the Island. “Be noble, be faithful, be loyal”, with these words, the dubbing with the sword and the award of the cross and the mantle “that the robe of divine protection will ever encompass him who is faithful and loyal”, the candidates were accepted as new members of the Military Order of the Collar of Saint Agatha. Shortly before the clergy, the knights and the dames had come together in the cloister of the ancient Military Hospital of Palma to enter the church of Santa Margarita in procession. The symbolism of the procession is “to set out upon the way to God”, an essential aspect of this Order which finds its most important commitments in the defense of the Faith and of Christian values. The chaplains who had been designated knights of the Order were the military chaplain Francisco Ruìz, the canon lawyer Antonio Pérez Ramos and Blas Rodrìguez Boyero. Then nine knights were invested and finally three dames of various nationalities. The Order is organized in priories, the most numerous being that in Sweden with about 150 members, declared Estela Velasco de Lebròn, chancellor of the Grand Priory. The Spanish priory is designated by the name of Grand Priory of Aragon and Catalonia. After the conclusion of the ceremony in the church of Santa Margarita, the participants went on to dine at San Termens. Just before celebrating 800 years since the birth of James I, the Military Order of the Collar of Saint Agatha (founded by the same Conqueror) has chosen Majorca to hold one of its annual events. Some fifty people, coming from different countries and led by Francesco Paternò Guttadauro Ayerbe of the Dukes of Carcaci, Prince of Emmanuel, spent this weekend in Majorca, where they participated in various events and ceremonies. The first of these took place on Saturday with the ceremony of investiture of the Grand Priory of Aragon and Catalonia in the church of Santa Margarita where 15 new members of the Order were invested. Yesterday, Sunday, the knights traveled to Miramar, where they could enjoy one of the most beautiful spots in Majorca and get to know a bit more of the history enacted by its founder James I The Conqueror. Later they continued to Son Marroig where they were received by Isabel Ribas, the owner of the property which had belonged to Archduke Luìs Salvador of Austria. In the music room Dr. José Maria Sevilla gave an explanation to the knights about “The Fable” of Guillem de Torrella and the voyage that he made in the 14th Century from the port of Santa Catalina in Soller to Sicily. Dr. Sevilla also presented the knights to Pere A. Serra, President of the Serra Group of Companies, who presented to Don Francesco Paternò a volume of “The Fable”, with illustrations by the artist Juli Ramis, produced by the Serra Group. The Military Order of the Collar of Saint Agatha of Paternò was founded by James I with the aim of reconquering the kingdom of Majorca. Across the centuries his descendents have been charged with keeping it alive. Today the organization has lost its military character and its aims are now works of charity. The Order meets twice a year, once in Sicily and the other time in a different city, which this year was Palma. Francesco Paternò was quite clear about it. Among the various titles which make up his name there is one that links him closely with Majorca and that is he because he is, son they say, a direct descendent of King James I of Aragon, James The Conqueror. How is your branch of the family related to James I of Aragon? Our family is descended from James I by virtue of his last marriage which was with Teresa de Vidaure. A morganatic marriage since she was only a noblewoman, a lady in waiting to the previous queen. Is this your first visit to Majorca or do you already have links with it? Indeed I have links with it. But it is the first time that I have been to Majorca and, now that we know it, we shall certainly return. What impression has been made on you by this land conquered by your ancestors? I have been very warmly received. In truth I have visited some very beautiful places, such as Miramar, which have surprised me greatly as Majorca is known for its social life and entertainment but it is on the other hand full of history. What kind of life do you have as a prince? I lead a very normal life. I live in Catania and have the life of any other human being but I have the immense luck to have all this history behind me. Do you have documents which establish your connection with King James I? Yes, we have historical documents which connect us with James I. The most recent we produced only lately with the express aim of clarifying matters and on the basis of it the Italian Tribunals recognize me as the descendent of James I. This most recent recognition dates from 2002. Until then you had not been recognized? Yes, indeed we were, but I would rather not go into detail at this point to avoid any misunderstanding. Since the times of my grandfather, Grand Master in his day, some wires have been crossed and I prefer to make a complete historical investigation. Följande artikel var införd i tidskriften Prospettive som ges ut av Katolska Ärkestiftet i Catania, Sicilien. Photo : Military Order of the Collar of Saint Agatha of Paternò. From the left : The Grand Master Prince don Francesco Paternò Castello di Carcaci, the Grand Chancellor Prince don Stephen Screech, don Patrick Walesby, Secretary of the English Grand Priory don Maurizio Fantato, the Herald don Francesco Maria Mariano and the Governor of the Royal House of Paternò Prince don Marcello Cocuccio. 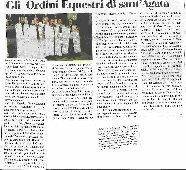 Last year at the Feast of Saint Agatha we noted that in the constellation of Orders of knights and religious in Genoa there was active a Congregation of Holy Schoolmistresses of Saint Agatha. This year we wish to honour our Patron by revealing the existence of two orders of chivalry that bear the name of Saint Agatha : one in Catania and the other in San Marino, that in the recent past have both taken part in the annual festivities of our patron saint. On Friday the 3rd February in the traditional senatorial procession of thanks and propitiation by the offering of candles to Saint Agatha, the titular of our cathedral as well as the patron of the city and the archdiocese, there will process for the third time according to the time honoured ceremonial 35 of the knights and dames and their chaplains members of the chivalric Order of the Collar of Saint Agatha, led by the Grand Prior of the Two Sicilies Ing. Marcello Cocuccio of Catania, with the Grand Chancellor the Englishman don Stephen Screech. Among those taking part will be delegates of the three other Priories that constitute the Order in England, Spain and the Nordic countries. At 5.00 p.m. in the evening of the same day in the church of San Placido by the Cathedral, previously Benedictine monastery, there will be held the General Chapter of the Military Order of the Collar of Saint Agatha of Paternò with a ceremony of investiture for five new knights, who will be admitted into the chivalric fraternity in the presence of three English Benedictine chaplains. At the Solemn Pontifical Mass of the bishops of Sicily, of the cathedral and collegiate canons and the parish priests of the city, presided over by the metropolitan archbishop of Palermo, Cardinal Salvatore De Giorgi, president of the Sicilian Episcopal Conference, the Grand Prior of the chivalric Order of the Collar of Saint Agatha, don Francesco Paternò Castello di Carcaci from Catania will take the lead of a delegation of his confreres. This Order of the Cross. Patrimony of the Most Serene Royal House of Paternò and whose foundation dates back to around 1200 from the wish of the Aragonese kings of Majorca to combat pirates from North Africa and expel Islam from the Balearic Archipelago, has among its formal aims charitable and welfare activities. Currently through its hospitaller service it has undertaken the construction of a refuge in Bulgaria, the maintenance of an educational centre for blind children in India and of a mission in Peru. The uniform worn by its members, to be found even across the Baltic states, is a white mantle with a carmine red collar and a cross on the heart side of the chest. Even in the Scandinavian countries there still linger some signs of devotion to Saint Agatha : on the 5th February there is a popular tradition whereby women do not comb their hair as a sign of respect towards the martyr who after the most atrocious torture gave up her soul to God on that day. The Order has Saint Agatha as its Protectress and Patron. Its members are divided into four categories : Justice and Devotion, Grace and Devotion, Justice for Merit, Grace for Merit. The classes of members are as follows : Knights of Grand Cross with Collar, Knights and Dames of Grand Cross, Knights and Dames. New members are admitted to the initial class. Investitures take place on two occasions every year : the 5th February and the 7th June. The Grand Magistry is constituted by the Grand Master, the Grand Chancellor or Governor and the Supreme Counsel. The Grand Master is the legal and hereditary head of the Order in the person of the Head of the House of Paternò Castello e Guttadauro, the Prince of Emmanuel. From the Chancellor depend : the Magistral House, the House of Professed Knights, the Hereditary Commanderies, the Grand Priories, the Priories and the Commanderies with designation. There is provision for the offices of Marshal (head of ceremonial), Hospitaller, Visitor, Grand Prior, Prior and Commander. The Order fell into abeyance for a long time but was restored in 1851 and received official recognition. The motto of the Order under the Grand Magistry of a member of the House of Paternò is “Impavidus pavidum firmo”. L’anno scorso, per la festa di s.Agata, abbiamo reso note che, nel firmamento degli Ordini e degli Istituti religiosi di vita consacrata, a Genova, opera la Congregazione delle Maestre Pie di Sant’Agata. Quest’anno, vogliamo onorare la nostra Patrona con il divulgare l’esistenza di due Ordini equestri intitolati a sant’Agata : uno catanese e uno sammarinese, che nel recente passato hanno partecipato alle annuali feste patronali agatine. Venerdì 3 febbraio, alla tradizionale processione “senatoriale”, di ringraziamento e di propiziazione, per l’offerta votiva della cera a sant’Agata, titolare della cattedrale, patrona principale della città e dell’arcidiocesi, per la terza volta, sfileranno, secondo il cerimoniale vigente, 35 tra confrati-cavalieri e consorelle-dame, dignitari e cappellani dell’Ordine cavalleresco del Collare di Sant’Agata, guidati dal gran priore delle Due Sicilie ing. Marcello Cocuccio di Catania, con il gran cancelliere, l’inglese don Stephen Screech. Fra i partecipanti sono inclusi delegati dagli altri 3 Priorati, in cui è articolato l’Ordiune d’Inghilterra, di Spagna e delle Terre Nordiche. Al vespro dello stesso giorno, alle ore 17, nella chiesa ex monsatica benettina “San Placido” al Duomo, si terrà il capitolo generale del Militare Ordine del Collare di Sant’Agata dei Paternò con la cerimona d’investitura di 5 nuovi cavalieri, che saranno ammessi nel sodalizio cavalleresco alla presenza dei tre cappellani benedittini inglesi. Al solenne pontificale dei vescovi di Sicilia, dei canonici metropolitani e collegiali e dei parroci della città, presieduto dall’arcivescovo metropolita di Palermo, il cardinale Salvatore De Giorgi, presidente della C.E.Si., interverrà a guidare i confratelli il Gran Priore dell’Ordine equestre del Collare di Sant’Agata, il catanese don Francesco Paternò Castello di Carcaci. L’Ordine “di croce”, patrimonio della serenissima Real Casa Paternò e la cui fondazione rsiale intorno al 1200 per volontà dei re aragonesi di Majorca allo scopo di combattere i pirati del Nordafrica e di estirpare l’Islamismo dall’arcipelago delle baleari, ha tra i suoi scopi istituzionali l’attività caritativa ed assistenziale. Attualmente, per mezzo del suo servizio ospedaliero, è impegnato nella costruzione di un asilo in Bulgaria, nel mantenimento di un centro edicativo per bambini ciechi in Indiae in una missione in Peru. La divisa che indossano i suoi 150 membri, sparsi anche nei Paesi Baltici, consiste in un mantello bianco, con colletto di color carminio con la croce sul petto, dal lato del cuore. Proprio nei Paesi Scandinavi, resistono ancora alcune manifestazioni di devozione verso s.Agata : il 5 febbraio, è usanza popolare delle donne non pettinarsi i capelli, in segno di rispetto verso la martire che, tra i tormenti più atroci, rese l’anima a Dio quel giorno. L’Ordine ha come protrettrice e patrona s.Agata. I suoi membri sono distinti in 4 categorie : Giustizia e Devozione, Grazia e Devozione, Giustizia al merito e Grazia al merito. Le classi dei membri sono le seguenti : cavaliere di Gran Croce con Collare, cavaliere / dama di Gran Croce, cavaliere / dama. I nuovi membri sono ammessi al grado iniziale. Le investiture hanno luogo due volte l’anno : il 5 febbraio e il 7 giugno. Il Gran Magistero è formato dal Gran Maestro, dal Grand Cancelliere o Governatore e dal Supremo Consiglio. Il Gran Maestro è il capo giuridico ed ereditario dell’Ordine, in persona del capo della Casa Paternò Castello e Guttadauro, principe d’Emmanuel. Dal cancelliere dipendono : la Casa magistrale, la Casa dei professi, le Commende ereditarie, i Gran Priorati, i Priorati e le Commende con titolo. Sono previsiti gli uffici di maresciallo (capo del cerimoniale), di ospedaliere, di visitatore, di gran prioer, di priore e di commendatore. L’Ordine era caduto in desuetudine per lungo tempo, ma fu restaurato nel 1851 e riconosciuto ufficialmente. Il motto dell’Ordine, sotto la gran maestranza d’un Paternò, recita “Impavidus pavidum firmo”. The day before yesterday, in Ohrid’s Catholic Church, was held the inauguration of the four new applicants from the Catholic and Orthodox churches, who were received into the dynastic order of Saint Agatha of Paternò. The ceremony applied the strict rules of the Order, which counts more than 1000 members now, and that contains precious symbolism that survived through the centuries. With their cloaks and swords, the procession was made recognisable by the unchanged rites since centuries. 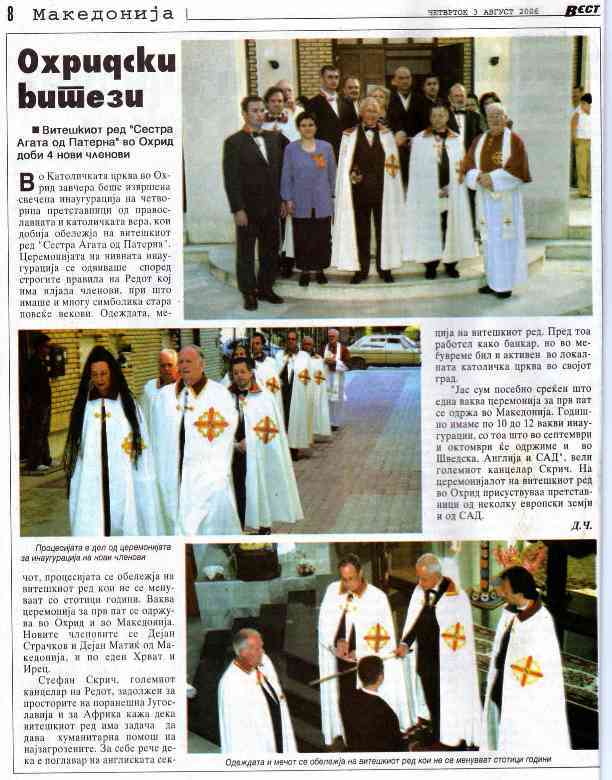 It was the first time that such a ceremony took place in Ohrid and in Macedonia. The new members are Dejan Strackov, Dejan Matik of Macedonia, a Croat and an Irishman. Stephen Screech, the Chancellor of the Order, who is in charge of for Yugoslavia and Africa’s areas, said the Order has to give a humanitarian aid to the most penniless. In the past, Stephen Screech used to work as a banker, but meanwhile he was active in the Catholic Church of his city. He said: I am especially happy that such a ceremony takes for the first time place in Macedonia. We have 10 to 12 similar ceremonies per year. The next ones will take place in England in September and in Sweden in October, said the Chancellor Screech. The ceremony had the privilege to have the presence of people coming from several European countries.